Following a wonderful event on 12 November with Queens Memory at which participants shared their memories of the neighborhood, take two will be this coming Saturday! 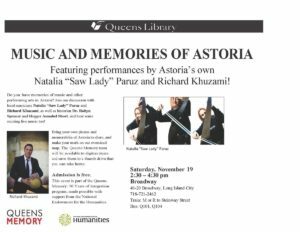 Join us for “Music and Memories of Astoria”. Where: Queens Library, 4020 Broadway, Queens, NY 10003 (basement community room). Join your neighbors in sharing stories and memories of what Astoria was like when you arrived. 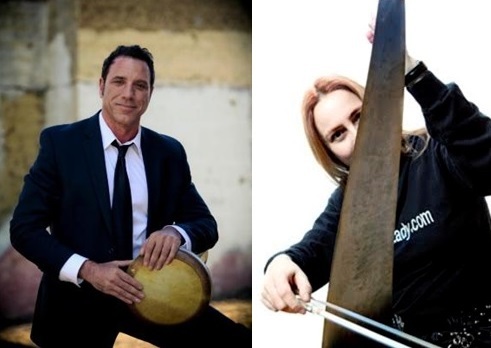 And hear local musicians including Natalia “Saw Lady” Paruz and Richard Khuzami perform. Bring your own photos and memorabilia of Astoria to share, and make your mark on our oversized map. The Queens Memory team will be on hand to digitize your items for inclusion in the Archives at Queens Library and save them to a thumb drive you can take home. Dr Robyn Spencer of Lehman College, and Annabel Short of the project “30th Ave – A Year in the Life of a Street” will also share their perspectives on the neighborhood. The event is part of the Queens Memory: 50 Years of Integration program, made possible with support from the National Endowment for the Humanities. We look forward to seeing you and please spread the word. You can just show up, or RSVP via Eventbrite.